» Hello, I am God. Are you getting Tenchu Z ? Don't forget to look at the calendar! 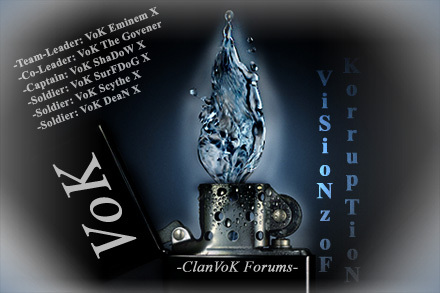 The calendar is there for things like VoK Upcoming matches or important events and announcements. We are ready to make lots of blood! I played the Beta, and i have to say it was cool getting alittle sneak peak, but the beta pretty much sucked. I mean i got bored after 20 minutes of the same maps, anyone else feel the same or differently about it? I'm sure the actual game will be better no doubt. ps. i wish they would throw in the old halo1 pistol! In the past week, Call of Duty fans have been mercilessly teased by the companies behind the franchise. First, an Infinity Ward employee stated that the developer had some big news coming up this weekend, but declined to give any insight as to what it would be. Then, Activision confessed that Call of Duty 4: Modern Warfare was in the works...and that it would forego a World War II setting and time-warp the series up to modern times. Grito distante Productions is the name i use when making movies if you want to join PBP then send me a PM over this site i will be sure to add you down as a member. we here at GdP would like to thank VoK EmiNeM X for such a great site! so far Grito distante Productions is a small movie making group containing only one member. we have three videos two map videos: DawnAtTheDocks & Shrink Machine and one other FarCry Video: Fun with Optimatch.